This theme has an intro page developed completely in CSS3. Yes, that’s right, these animations are not based on Flash. 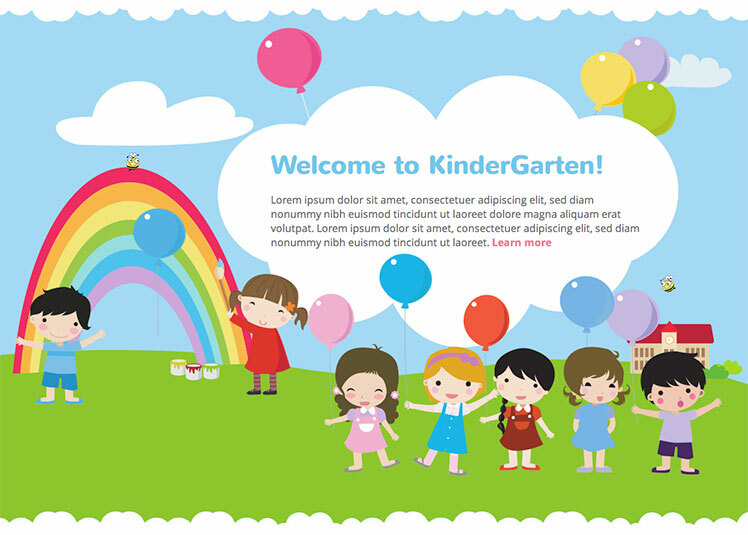 The intro page shows a drawing of a kindergarten with kids playing with balloons, drawing rainbow and with animated flying bees. A website for kindergarten is there to impress not just parents, but also their children. That’s the logic that we were following while designing this theme. It’s not just about the intro animation. All inner pages of the theme are full of interesting drawings of kids and animals having fun while they are learning. Hot Kindergarten is a responsive WordPress theme based on latest version of Sparky WordPress theme framework. It comes with theme files, sample data and several useful plugins for WordPress that can be used for making galleries and slideshows for your site. Responsive theme based on valid HTML/CSS code. 3 pre-defined styles with different main colors (pink-blue-green, purple-yellow and green-yellow). Each color is easily customizable in Sparky options page (infinite color combination). 11 collapsible and responsive widget positions. Unlimited widget positions can be added easily within Sparky Framework, if you need more.